Remigius was born in 437, traditionally at Cerny-en-Laonnois, near Laon, Picardy, in northern Gaul, into the highest levels of Gallo-Roman society. He is said to have been the son of Emilius, count of Laon (who is not otherwise attested) and of Celina, daughter of the Bishop of Soissons, which Clovis had conquered in 486. The birth of Saint Remigius was foretold to his aged parents by a holy hermit called Montanus. From childhood the noble youth devoted himself to the acquisition of secular and sacred learning and then withdrew to a little house near Laon, where he led an exemplary and virtuous life of holy solitude. When the see of Rheims became vacant, the clergy and people resorted to his retreat and carried him off as their bishop-elect in spite of his being only twenty-two years of age and a layman. At the time of his consecration in 459, his brow shone with light and was scented with a heavenly fragrance. Of the notable men of Flanders and Northern Gaul, the young bishop soon became the most renowned. Pagans were converted and Arian heretics brought to repentance through his ardent preaching. He established dioceses, set up parishes and inspired the inhabitants of districts recently devastated by barbarian raids with love for enemies, detachment, and a longing for the good things of the world to come. Everywhere he preached, the truth of his words was confirmed by miracles. When he ate, the birds came to take their food from his hands. He healed the sick, delivered those possessed by evil spirits and once, when the city was on fire, he threw himself into the flames and drove them back. During the years when the Roman West was in agony through the invasions of barbarian peoples, the Visigoth and Burgundian adherents of Arianism occupied the South of Gaul, the Alemani occupied the banks of the Rhine, and the Franks who were still pagan the North of Gaul. On the death of his father Childeric in 482, Clovis, who was only fifteen, became King of the Franks. Although he was still an idolater, he admired the monks and had a great respect for the Orthodox bishops, especially Saint Remigius, whose sound advice he followed. In 493, he married Saint Clotilde (June 3) who also influenced him for the good. As his army was retreating before the Alemani, Clovis turned to the God of Clotilde and Remigius, and won a brilliant victory at Tolbiac. God’s answer to his prayer made him decide to become a Christian and he asked Saint Remigius to instruct him in the rudiments of the faith. As he listened to the Bishop describing all that happened to Christ in His Passion, the great-hearted warrior exclaimed, "O if only I had been there with my Franks to set Him free!" Two years later, he summoned all the magnates of his realm and from beyond its borders to come to Rheirms for his Baptism. On the eve of that day Saint Remigius had the King and his retinue come into the church, where in powerful words he set before them the worthlessness of false gods and the great mysteries of the Christian faith. All at once a heavenly light and fragrance filled the church and they heard a voice from on high that said, "Peace be with you." As he immersed him in the waters of the new birth, Remigius said to the King, "Bow your head, proud Sicamber; worship what you have burnt and burn what you have worshipped." But when the moment came for anointing the newly-baptized King with holy Chrism, the Bishop saw that it was lacking. Raising his eyes to Heaven, he implored God to provide it, whereupon a white dove came down from Heaven with a vial of miraculous oil. 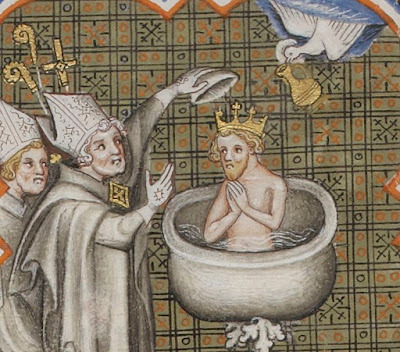 Two of the King’s sisters and three thousand of his lords and warriors were baptized at the same time as Clovis, according to Saint Gregory of Tours. This event was decisive for the conversion of the Franks and for the birth of France as a Christian nation. 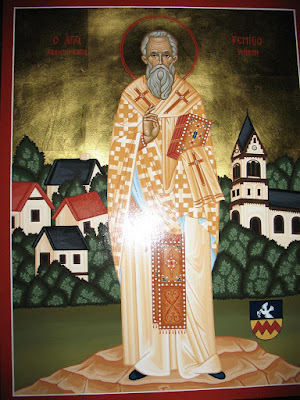 With the spiritual guidance of Saint Remigius, Clovis, like a second Constantine, sought in the years that followed to bring together the barbarian newcomers and the Romanized inhabitants of Gaul, and to confirm his people in the true faith. 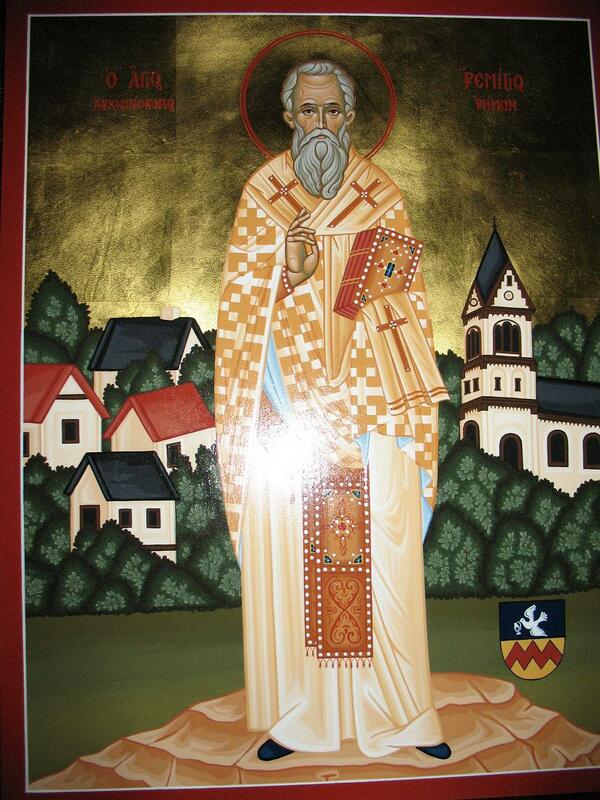 In 517 he held a synod at Rheims, at which after a heated discussion he converted a bishop of Arian views. In his old age, Salnt Remigius went blind but, steadfast in prayer and hope, he miraculously recovered his sight; he served the Divine Liturgy for a last time and fell asleep in peace in 533. Saint Remigius' relics were kept in the Cathedral of Rheims, from where Archbishop Hincmar had them translated to Épernay during the Viking invasions and from there, in 1099 to the Abbey of Saint-Remi.